At 111 years old, the New York City subway is one of the longest-standing public transportation systems in the world. It’s also one of the most used, and it boasts more stations than any other metro. So it’s not surprising that many of them have been retired over the past century. Some have been strategically shuttered -- casualties of a continually changing transit layout -- while others have fallen into disrepair. 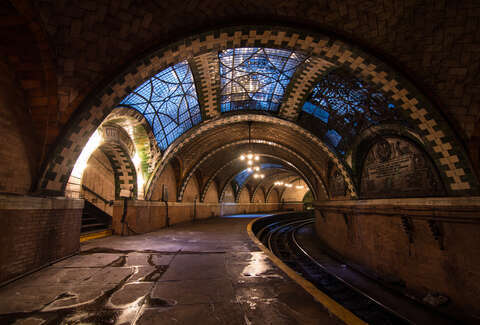 Here are 10 of the city’s most intriguing subway stops of yore, from an exemplar of turn-of-the-century architectural glitz to an unfinished shell-turned-illegal art gallery. 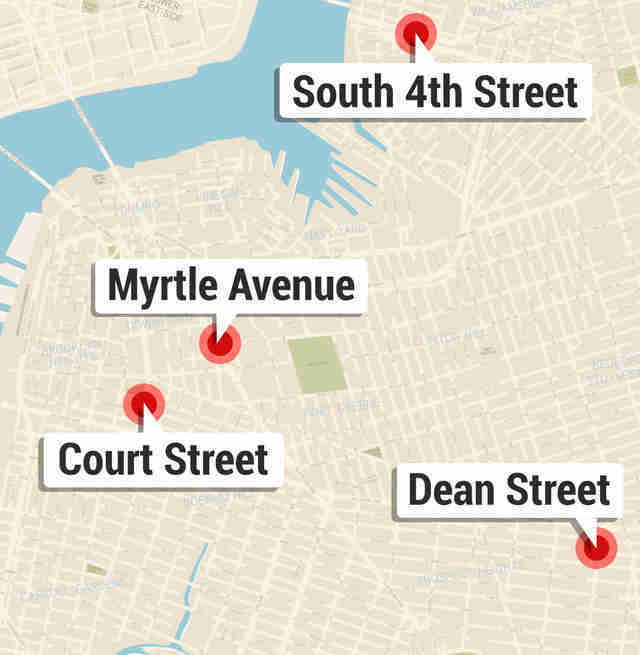 We’ve also included a map at the bottom to show where these stations were/are (though it should be noted that one station -- the existence of which has been hotly debated -- remains unplottable). City Hall station was the original southern terminal of the Interborough Rapid Transit subway. Completed in 1904, it was designed to be the showpiece of the city’s newest mode of transportation. With its Roman brick walls, leaded glass skylight, brass chandeliers, and vaulted arches decorated in the same Gustavino tile that adorns Grand Central Terminal and Carnegie Hall, the station exudes a grandeur that we can safely say is a thing of the subway’s past. The station was decommissioned in 1945 when it became clear that its tightly curved track would be unable to accommodate the longer trains necessitated by an ever-growing ridership. But it’s still visible to those in the know: stay on the 6 train past the last stop, and you’ll be able to catch a glimpse as the train heads through the abandoned station on its way back Uptown. Like the old City Hall stop, the Worth St station is also visible from the 6. If the train moves slowly enough between Canal St and Brooklyn Bridge, you’ll be able to spot the station’s name on its tile-clad support columns, as well as a few terra-cotta W's adorning its walls -- both tributes to the Mexican-American War major-general William Jenkins Worth. (He also boasts a monument at Broadway and 24th St.) The third northbound station built on the original IRT line, it was decommissioned in 1962 to accommodate the northward expansion of the Brooklyn Bridge station. It’s now decked out with some impressive graffiti work. Unlike other decommissioned stations, Court St remains fully operational -- thanks in part to its reincarnation as the New York Transit Museum. 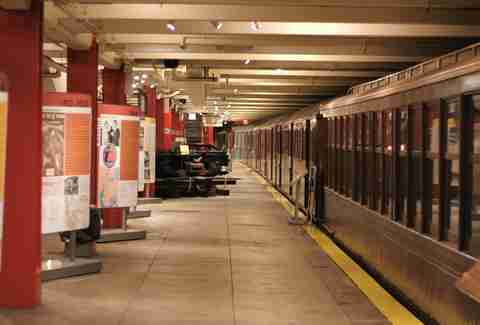 To this day, vintage trains are moved into and out of the museum using the station’s tunnel and the outer tracks of the neighboring Hoyt-Schermerhorn Sts stop. The station opened in 1936, part of a plan in which local trains would operate within boroughs and express trains between them. It also played a role in one Brooklyn-inclusive outline of the the still-to-be-completed Second Ave subway line. Due to its proximity to so many other Downtown Brooklyn stations and the fact that it was reachable only by transfer, it got little traffic and closed in 1946. In the 1960s, the station began to make its way into movies, most famously the 1974 thriller The Taking of Pelham One Two Three. The station reopened to the public for the first time on July 4, 1976, housing The New York City Transit Exhibit in honor of the United States Bicentennial. The exhibit was so popular that it stayed open permanently, morphing into a full-fledged museum that showcases the history and technology of the city’s public transportation. 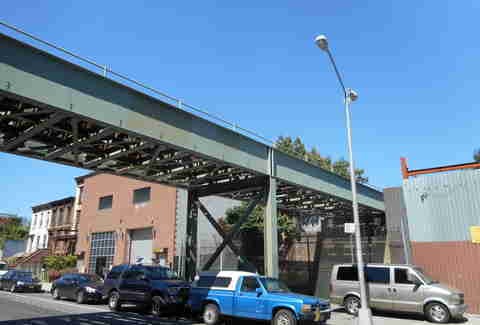 Myrtle Ave was a local station on the Brooklyn-Manhattan Transit line located between the Manhattan Bridge and DeKalb Ave. Closed to allow the reconstruction of a flying junction that would increase the line’s capacity, its southbound platform was removed, while its northbound platform was abandoned. Since 1980, the remaining platform has been home to Masstransiscope, a trippy installation by film artist Bill Brand. Structured like a zoetrope (a 19th-century optical toy), the work consists of 228 hand-painted panels that cover the full 300ft length of the station and are seen through a series of vertical slits. Hop on a Manhattan-bound B or Q train at the DeKalb stop and, as the train moves in front of the panels, you’ll witness the illusion of a 20-second animated movie. Check out this video for a behind-the-scenes peek at the installation’s 2008 restoration and to hear from the artist himself. This twice-closed elevated station in Brooklyn’s now up-and-coming Bed-Stuy neighb may have been doomed from the start, earning its distinction, as the New York Times once said, “in ways more often grim than glorious.” First opened in 1897, it went relatively unused and was closed two years later. Local property owners were so outraged that the station was opened again in 1901 and, though it continued to lose traffic to the nearby Franklin Ave station, it was upgraded to accommodate six-car trains in 1924 along with the rest of the Franklin Ave line. 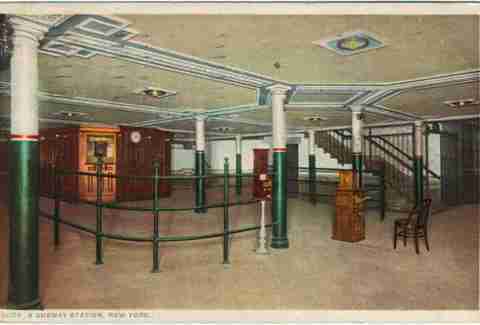 The station continued to suffer from low fare collection -- largely caused by a host of turnstile-jumpers -- and gradually fell into disrepair until it was shuttered in 1995. At that time Dean St, according to the Transit Authority, was collecting on average a measly 82 tokens a day, making it by far the least used of the city’s 400-plus stations. The Sedgwick Ave station opened in 1918 as an extension of the 9th Ave El, New York City's first elevated railway famous for its 90-degree "Suicide Curve" at 110th St. 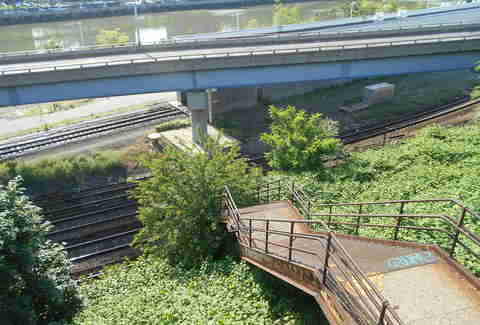 Located near the Harlem River in the Bronx, the station was built as a point of transfer from the El to Metro-North predecessor, the New York Central Railroad. It was also an important stop along the shuttle between the old Polo Grounds and Yankee Stadium, a train service beloved by baseball fans -- which gave rise to the term "Subway Series." The shuttle was discontinued in 1958 when the New York Giants jumped ship to San Francisco and the Sedgwick Ave station became obsolete. Its elevated steel structure was removed, but the platform and tunnel remain. Take the 4, B, or D train to 161 St, and walk across the footbridge over Sedgwick Ave and the Major Deegan Expressway. There you'll be able to make out the ground-level portions of the old station hiding under the highway. Most of the city’s abandoned subway stations sport at least a minor air of mystery, but this one’s very existence has been hotly debated for years. “The station cannot be found on any map, however, nor can it be reached by any train,” the New York Times wrote in 2003. “If it exists, in fact, it is nothing more than a dark four-track IND subway station with blue tiles, on the A line near Ozone Park, Queens.” The station is rumored to be part of a plan to extend the A line to 229th St in the Cambria Heights area of Queens and to lie behind a tunnel that was sealed off in 1952 -- meaning that even if it does exist, it’s near-impossible to access. There is next to no visual documentation of the station, though the daredevil urban photographer known as Dark Cyanide recently snapped some pics of a concrete wall he believes it’s hiding behind. Beneath Williamsburg’s South 4th St lies a six-track station that was once intended to be a major point of transfer for the IND Second System. When its construction was halted by World War II, it was left without through tunnels or lighting, its stairwell and poured concrete walls unfinished. But in 2009, the station was brought back to life when street artists PAC and Workhorse invited 103 peers from around the world to adorn the space with their own creations, mostly large murals painted directly onto the barren walls. 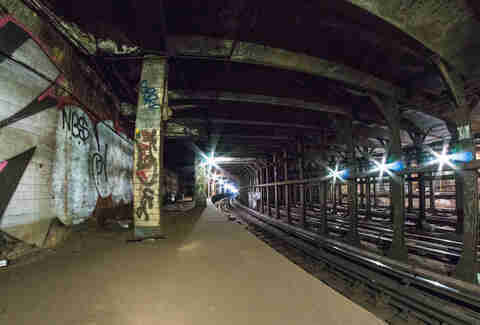 One of the largest exhibitions showcasing this type of work in a single space, The Underbelly Project was illegally mounted and reachable only, as one intrepid New York Times reporter explained, by “waiting at an active station’s platform until it’s empty, slipping from it into the damp and very dirty no man’s land beyond, and traversing that to get to the old station’s entrance.” The space has since been sealed off by the MTA who claims to be protecting the artworks, but that hasn’t stopped some more recalcitrant urban explorers from attempting to sneak in. 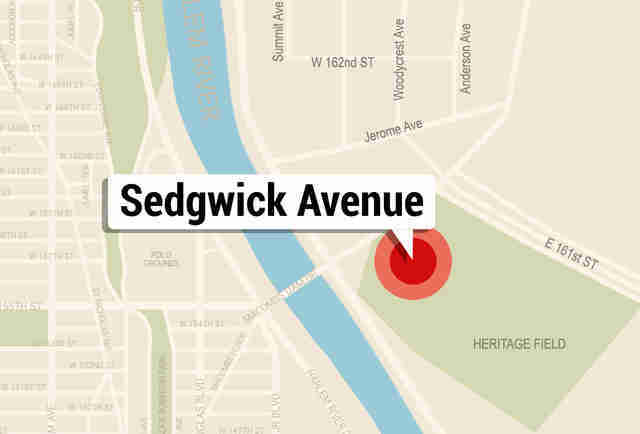 If you’d prefer to get a glimpse of the space without getting arrested, check out this video. Nina Stoller-Lindsey is a Brooklyn-based writer who's covered arts and culture for Time Out New York and New York Magazine. Reach out to her on Twitter or through her website with speakeasy endorsements or to debate the merits of growing up in New York City.